Toronto, ON and Buffalo, NY – October 18, 2017 – Crosslake Fibre announces today that it has begun its underwater marine survey for its Lake Ontario submarine fibre-optic cable project. The marine survey is a critical aspect of development for the new 60km cable being developed by Crosslake Fibre across Lake Ontario. 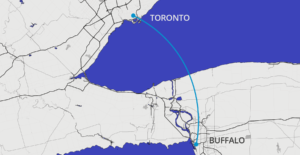 Crosslake Fibre’s Lake Ontario project is an unrepeatered submarine fibre-optic cable system that will be the first system across Lake Ontario to directly connect Toronto, Canada and Buffalo, New York with dark fibre. The submarine cable is part of a 131km high fibre count network to provide diverse, low latency connectivity to enterprises, content providers, and carrier customers between data centres in Toronto and the United States. The ready-for-service (RFS) date for the system is September 2018. Crosslake has engaged Canadian Seabed Research Ltd. of Porters Lake, Nova Scotia to undertake the marine survey. “Canadian Seabed Research is honored to have been selected by Crosslake Fibre to conduct the submarine Geophysical and Geotechnical route surveys for this historic, fibre-optic cable installation across Lake Ontario waters,” states Glen Gilbert, of Canadian Seabed Research. The entire survey, including all geophysical and geotechnical data acquisition, will take about three weeks.